Don’t be confused: that open office concept (complete with the all-seeing boss in a raised, glass-walled office) is from an era when a more adversarial supervisor/employee relationship existed. Today, modern office design actively seeks to nurture trust and productivity—to create partnerships and a sense of ownership. In the past few decades, executives responsible for workplace productivity have been innovating in office design and office furniture. Workspaces have evolved from wall-less cubicles to concepts like hot desking and hoteling … and into even more ambitious concepts like activity based working (ABW), which can incorporate multiple design philosophies. One of the earlier experiments in modern office design came from Jay Chiat, the ad-man behind Apple’s famous Think Different campaign. On the ski slopes in 1995, he suddenly decided that he needed to think differently about his own company. Specifically how his employees interacted with each other. Chiat disliked that his employees spent their days largely isolated in their offices and cubicles. He wanted to create a space — like a college campus — where serendipity could happen … where colleagues could run into each other, chat about their current projects, and, maybe, collaborate to discover new ways to approach a problem. So he eliminated all job titles. He got rid of all landlines and desktop computers. Pushed all the workstations off the loading dock and into a dumpster. And mandated that when employees did visit the office to meet with clients or their teams, they’d have to store their personal items in a locker and sign out company-owned laptops and cell phones. There were too few laptops and cell phones to go around. The lockers were too small to accommodate all the paperwork a busy ad agency generates. And lacking space to work, some people simply started playing hooky. So what was Mr. Chiat trying to accomplish with his take on the open office? He was chasing the big idea. He was trying to foster a workplace culture that would generate more and better work. And he was trying to do it with office furniture and interior design. The ultimate vision was realized evenutally with the creation of an indoor "city" concept that went far beyond open office, and offered various environments or workzones to inspire creativity in an organization that sells creativity. That’s what all modern office design theories are trying to do: build a company where people want to work, where they enjoy their work, and where they do their best work. How companies create that with their office design has definitely evolved. 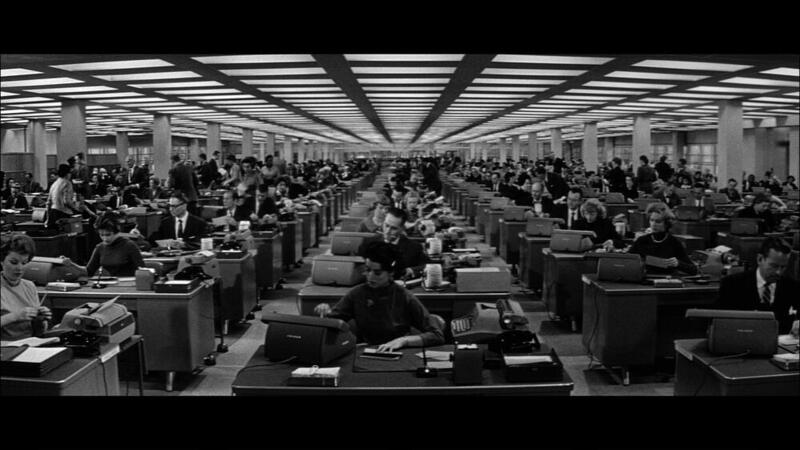 An antidote to the cubicle farm, wall-less cubicles were the first step in the open office concept. By literally knocking down walls, or in some cases reducing them to half-walls, the isolation of the cubicle was reduced. In addition to greater collaboration, reducing space is one of the reasons companies chose to go with wall-less cubicles. Without the walls, desks can be placed closer to each other and businesses can save money on rent: money that goes to the bottom line. With hot desking, there are fewer desks than people who need desks. The idea is that no one has their own desk, cubicle, or office. Instead, as need arises they are assigned a space. That space could be a regular desk. It could be a table. It could be a standing or sitting desk, or even just a reclining chair. In true hot desking, employees are given lockers in which to store their personal items, but they are even encouraged to rotate lockers lest they nest and become too attached to them. Hot desking relies very heavily on a mobile workforce, so if your business cannot be conducted at home, in a coffee shop, or on an airplane, it’s probably not for you. Hoteling differs from hot desking in that employees reserve the desk, cubicle, or office they want to use before they come in to work that day, but typically there are enough workspaces for every employee in the business. Hoteling, like hot desking, discourages routine. These companies don’t want employees to get in a rut. Like Jay Chiat’s open office idea, they want people to move around, meet new people, exchange new ideas, and ultimately become more productive workers. One of the most recent office design innovations is activity based working, or ABW. Just as in hoteling or hot desking, no one “owns” a desk in the ABW system. In fact, ABW is a design philosophy large enough to encompass both hoteling and hot desking. A company might have sections of the office devoted to one or both of those systems, in addition to other ABW-specific ideas. Like hoteling and hot desking, ABW is an idea that works best with groups or companies that have embraced mobile working. Unlike the other management systems, however, specific areas or zones are designated for specific activities like learning, meeting, focusing, socializing, or collaborating. This isn’t completely foreign to many of us. Conference rooms, for instance, are a form of activity based working. In ABW, however, this concept gets dramatically expanded. Most importantly, ABW is definitely not a space-saving solution. At its heart is the idea that people and teams work best when they are able to choose where they do it. So a company with 300 employees may have enough workspaces for 400 employees, ensuring that every team gets to work where and how it wishes. Furniture companies like Watson have created specialized products (like mobile storage, adjustable desks, or tables inspired by European coffeeshops) designed for specific types of activity zones. Products like these can help businesses and teams create custom spaces that work with today’s technology to improve all aspects of an employee’s work-life. Jay Chiat may have been ahead of his time, but his time has definitely come. Today’s workers, especially younger ones, expect employers to offer them the flexibility and mobility that are the hallmarks of modern office design. Be cautious before you jump on one of these bandwagons, however. Modern design systems give employees freedom of choice, flexibility, and can even be an incentive or perk. But many still want their own desk and their own space, and don’t like the idea of being forced into the mobile workforce. Plus, some jobs simply require a desktop computer, sometimes with multiple monitors. That’s not a job that can be hot desked. So before ripping out the walls and tossing all your furniture into the dumpster, you may want to run your ideas and your changes past the people they will most affect. Maybe even implement your new ideas slowly, as a pilot program. Change a conference room that operates on a reservation system into first-come-first-served. Repurpose an open desk or two into a learning station or other specialized activity. Taking baby steps like these can help you better understand whether ABW can work for you. Modern office design can have great benefits. There are real, tangible advances in productivity and morale that can result from accommodating flexible working styles, but don’t make the mistake of doing it without input from your teams. ABW, in particular, is a great way to chase business serendipity. It’s just not the only way. Take it slow. Talk to your people. Work with a professional designer. And develop a customized game plan that suits the needs of your company and of your workforce.